Die-hard fans of the Colt Wilbur Band know guitarist Ronnie Rhoads, as we welcomed him to the fold in September of 2017. Rhoads even added guitar to several songs on our "Heart of Stone" album when it was released. Rhoads, a veteran in the Pennsylvania music scene, has played extensively with bands like Laredo and Hired Guns. Rhoads also has vast experience both mixing and mastering music and owns Big Riff Studio in Mechanicsburg. According to the Big Riff Studio website, "We have a beautiful relaxing rustic lounge with plenty of coffee and refreshments on hand. After all, being comfortable is key to giving your best performance." In addition, he also played at length with national touring artist Michelle Wright as a touring musician and has been recording music for 35 years, recording in Los Angeles, Nashville, and many other places in between. 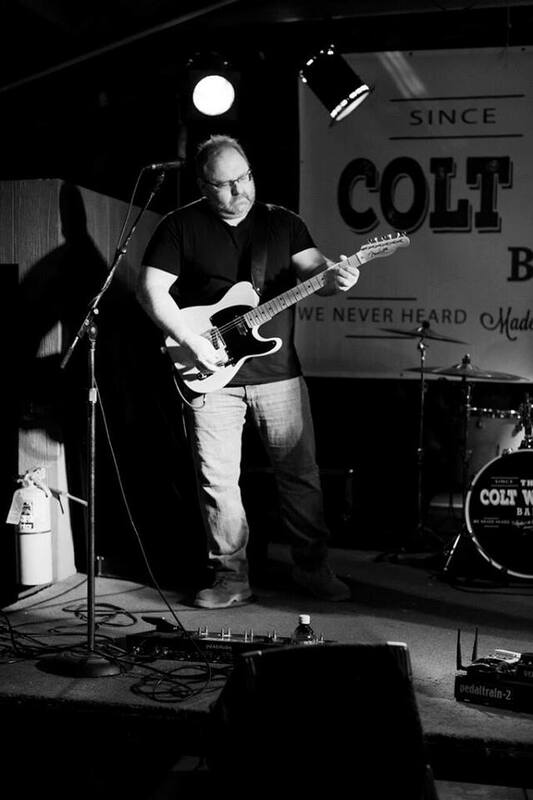 ColtWilbur.com recently had the opportunity to chat with Ronnie about his career in the music industry, what being part of the Colt Wilbur Band means to him, and other interesting tidbits about his musical journey. ColtWilbur.com: What was your best musical moment? Ronnie Rhoads: Probably the first time I stepped on stage in front of one hundred thousand people. That was the big moment and I tried to make sure I savored that. This was when I got my job with Michelle Wright. I think she was on Arista Records at the time. We were driving out to a show and I remember pulling in and I could see the giant towers and the PA columns and big screens in the distance. And I turned to one of the guys and said, “Hey, who is playing there?” and he says, “You are!” So, I just had to laugh because it hit me then and there that this was for real. So that was definitely one of the biggest ones. To tell you the truth, any time I can get into the zone where I can play and I seemingly have access to all of the information I’ve acquired over the years, and everything is just firing off perfectly, that is when there are always great moments for me. ColtWilbur.com: Tell us about how you got involved with the Colt Wilbur Band. Ronnie Rhoads: Colt and I had been friends for a while, and he approached me about playing on some tracks for the Heart of Stone record, doing a little cameo on the album. After that is when we started hanging out a bit more, then I started filling in when needed for local shows here and there. Then, when an opening arose, he just asked me if I wanted a job and it made sense to me. I always enjoyed playing with the band and felt that I was at home with Colt, Don, and Wally. ColtWilbur.com: What does it mean to you to be part of the Colt Wilbur Band? Ronnie Rhoads: It means that I have an outlet to go play music with my friends. I honestly consider all of the people in the band my friends and that is not always the case in music. I get to have fun every weekend and that really means a lot to me. It’s fantastic to get to have this luxury to play music with people who you get along with, I mean really have a lot in common with. Musically, these guys love the collaboration of writing music, and I think the new songs we are recording really have a unique sound. ColtWilbur.com: Do you think the Colt Wilbur Band are going to the next level in the music industry? Ronnie Rhoads: I think that is hard to say because today's music industry is so complicated. I definitely think we can if we wanted to. I feel though that I’m good right where I am, but that doesn’t mean I wouldn’t be open to bigger and better things if the opportunity presents itself. For me, I’ve done some pretty major things in music in my mind and for me the most important thing is spending time with my family and getting on my zero-turn mower and cutting the grass on Sundays. That is what makes me happy. Touring was cool when I did it 20 years ago, but I don’t know that I need that so much anymore. Still, I am a part of this group and if we have an opportunity to take this thing to the next level, I will do anything I can to ensure the success of the band. ColtWilbur.com: What if a promoter comes knocking about a regional tour? Ronnie Rhoads: I would never say never, but it would have to be such a great opportunity that I had no choice but to accept. I’ve had offers to go on the road in the last few years. I could go back out and tour right now and have had offers a few times over the last ten years, but I’ve turned it down. I like the simple things in life; being around my kids and my family and my home. ColtWilbur.com: What do you think the future holds for the band? Ronnie Rhoads: Colt is a very talented player, singer, writer, and all of the guys in this band have extreme talent. We absolutely have a future and I hope to play with them for a very long time. I really enjoy myself as a part of this group. To be honest, all I care about is making music that moves people. I don’t care about the fame or the fortune of it, I care about what it sounds like and making good music. That’s it.